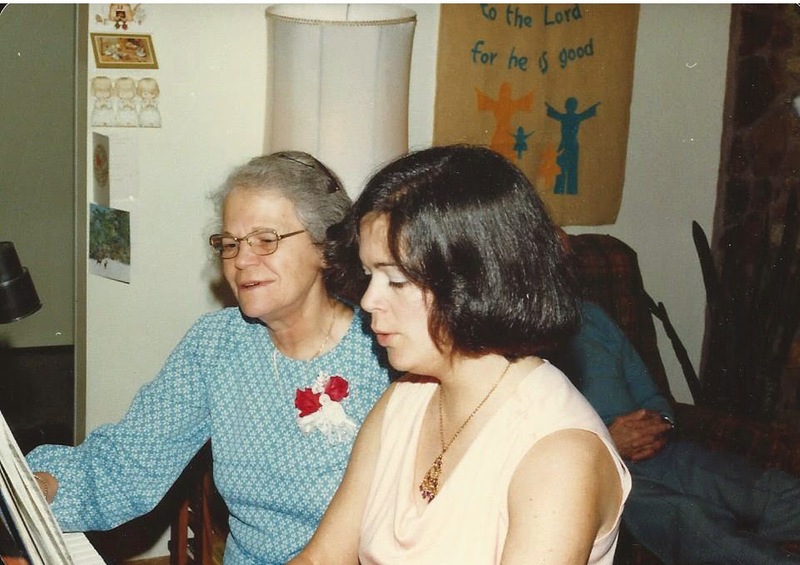 Mom and I singing at the piano, 1975. My parents were full of music and they passed it on, to all their children. Music has a huge effect, on how you look at life, and how, why and where we live, the way we do. Total mystery. Mom had a very true voice, not often heard. She was a shy little lady, 4'9" tall and pretty. Dad had a strange life, when young, and was very lucky in meeting a good violin player, Mr. Conacher. He took Dad under his wing and taught him how to play, and Dad did but he couldn't read a note of music, until we children took lessons and he did too. Mary... ended up with her A.T.C.M. "Solo Performer" certificate, at 19 years old. I just loved to hear her practice her scales, chords, arpeggios and octaves. Wonderful things to hear for an hour at a time. That was a thrill to me. I took violin at 10 years old, my teacher was a young man from Russia, Mr. Paul Knapper, and he was a good teacher. He went away, and at 15 I took lessons from Mr. Joe Leonard, an old man from England, who played in operas in London, England. I loved violin, but sold my instrument in Calgary before we moved to B.C It was my Dad's old violin and I was sad, it had traveled wherever I went. Charlie, my brother, took flute and piccolo lessons from Johnny Dickinson, also an old man who had played in London (England) Opera House... Johnny, and Gordon Cook, a wizard pianist, had both played at the London Opera House, when they were young. Every night we went to sleep to classical music, flute and piano, lovely. Eddie my younger brother, took violin. He was 12 years old, a late started, and he did very well. All of us would play together at time, it was fun. He didn't carry on for very long, more interested in sports and planned to join the army, which he did after high school graduation day. He had an excellent feel for the violin. My own children, and my grandkids, are all musical. It must be inherent in the family. Music can make you laugh and make you cry. I've just listened to a program on radio, "The Vinyl Cafe," its hilarious in words and music and I love it. 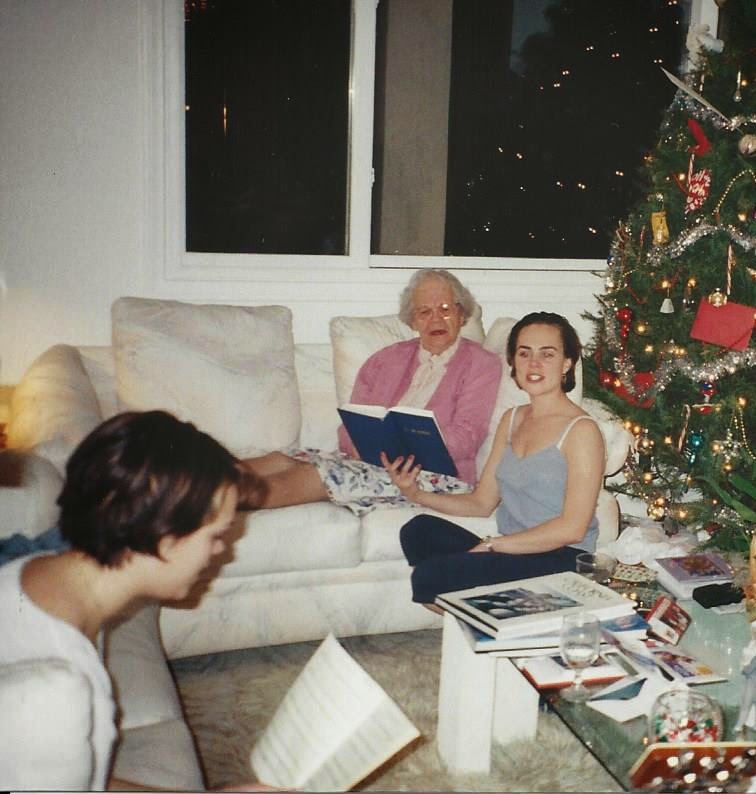 Letty with granddaughters Rachel (left) and Melinda (right) singing Christmas Carols in 1999. Granddaughters Michelle (l) and Rachel (r) around 1995. ATCM stands for "Associate of the Toronto Conservatory of Music," a precursor to the Royal Conservatory of Music, which has national Canadian standards for music performance and theory from beginners to very advanced students planning to study for a music degree. Mom never played the violin in my hearing. She had her violin repaired in the 1970s when a visiting friend who was a violinist, gave it a try, and pronounced it, "definitely not a Strad(ivarius.)" Dad confided to me that he'd heard Mom play, but she had lost the knack by then. 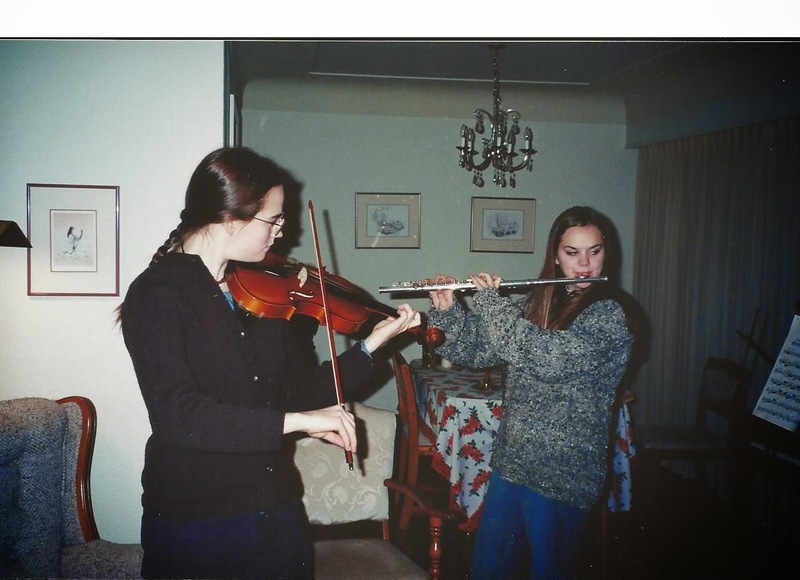 Photos show various family members making music at different times. I sing in a choir and have played piano, clarinet, and guitar. Rachel plays flute, keyboard, and sings and writes and records her own music. Michelle sings and played fiddle and guitar. 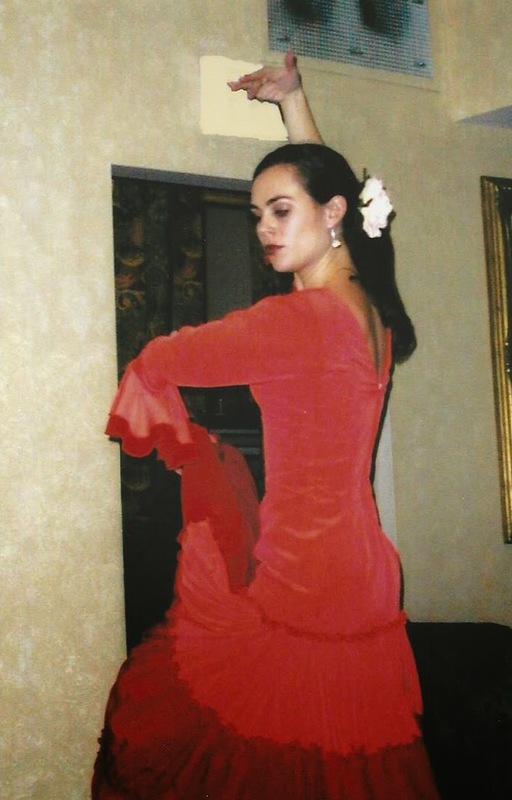 Melinda sings and dances flamenco. My brother, Bob, even sings karaoke at his favorite pub.